The Zeiss VR One Connect promises to bridge the gap between PC virtual reality, which offers impressive visuals and complex games, but comes with a high price tag for expensive headsets such as the HTC Vive and Oculus Rift, and smartphone-powered VR, which costs a lot less (as long as you have a handset already), but doesn’t quite offer the immersive experience of PC VR. Zeiss VR One Connect does this by running SteamVR games that are powered by a PC, which does all the graphical grunt work, and transmitting the footage to the headset, using your smartphone as a screen. While Zeiss hasn’t specified the exact minimum requirements for the smartphone you can use, it has said you need a “current” device with a screen size of between 4.7 and 5.5 inches. It also needs to run either iOS or Android. 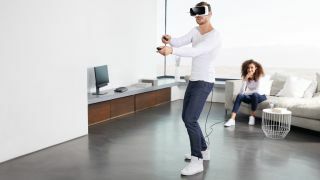 The headset, with the smartphone slotted in, is connected to your PC via a USB cable, and the Zeiss VR One Connect uses the smartphone’s built-in motion sensors to provide head tracking. To control the games, a pair of wireless Bluetooth controllers are also included. These controllers can sense three degrees of freedom (3DoF) motion thanks to sensors built by PXL Vision. The Zeiss VR One Connect system is compatible with many budget smartphone VR headsets, or you can use it with the Zeiss VR One, potentially keeping the entry price very low. While this sounds great, we do have some reservations. First of all, by controlling games using the 3DoF controllers, which send information to your smartphone, which then combines that data with information from its own motion sensors, before sending instructions to your PC, it could add an element of lag (where there is a delay between your movement, and the game responding), which could make playing VR games difficult – or even nauseating. Also, by relying on a USB cable, you’re losing out on one of the benefits of smartphone VR – full wireless freedom of movement. Instead, you’ll be tethered to your PC. Speaking of which, you’ll still need a machine that’s capable of playing SteamVR games, so it could end up costing a bit of money. However, if you already have a suitable smartphone and PC, then the Zeiss VR One Connect promises to be a very cheap way to get into VR gaming. Releasing at the end of 2017, the Zeiss VR One Connect, which comes with two wireless controllers and a USB cable, along with the required software, will cost $129 (around £100, AU$160). A bundle which includes the Zeiss VR One Plus headset will also be sold for $199 (around £150, AU$250). While we do have doubts, there is a lot of potential here, so we’re looking forward to getting some hands on time with it to see if the Zeiss VR One Connect lives up to its promises. IFA 2017 is Europe's biggest tech show. The TechRadar team is in Berlin to bring you all the breaking news and hands-on first impressions of new phones, watches and other tech as they're announced.